Woodland Trace is a centrally located community convenient not only to points of interest in Sarasota but also to counterparts in Bradenton and Lakewood Ranch. It occupies a 29-acre parcel just a block off the southwest corner of Saunders Road (63rd Avenue East) and Tuttle Avenue. 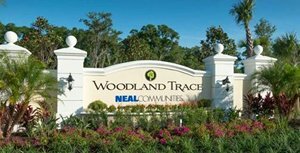 A development of prolific regional builder Neal Communities, Woodland Trace was launched in 2015. It consists of just 45 home sites nestling amidst wetlands, lakes and nature preserves which all in all constitute more than 50 percent of the community’s total acreage. The community’s open areas and natural preserves are the result of diligent land planning and Neal’s commitment to integrate its homes and communities in harmony with the environment. The developer’s environmental planners strived to do justice to Woodland Trace’s name by enhancing the property’s existing wetlands. They supplemented one of the site’s three lakes with shallow water and low-lying plants for an enlarged wetland area. All told, Woodland Trace flaunts three expansive wetland preserves with a combined area of eight acres. With this meticulous property setup, Woodland Trace homes for sale back up either to lush woodlands or a serene lake. This community put this strong selling point with its planners’ decision to place one nature preserve area along Woodland Trace’s north entry drive. This thus created a warm welcoming entrance to this gated neighborhood and set the winsome theme to its development. For all these features, Neal has assessed low community fees in this neighborhood. Neal Communities chose a Neo Classical architectural style for Woodland Trace homes for sale. The developer offers in this community four renditions of its bestselling 45-foot Cove Series ranging in floor areas from 1,870 to 2,367 square feet. Their layouts provide choices from two- or three-bedroom configurations with a den. Prospective buyers with an eye for additional storage can consider one plan providing for a three-car garage. The homes for sale in Woodland Trace offer wide open living areas and a bias on outdoor living. 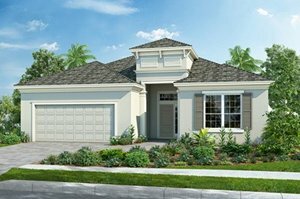 These floor plans are suited for a wide range of home buyers and are epitomes of a tropical Florida lifestyle. The superiority of Woodland Trace homes for sale is underscored in one of the most popular residential designs in this community, Endless Summer 3. This three-bedroom home with a floor area of 2,181 square feet, which also features two baths and a den, was adjudged best overall in its category during the 2017 Sarasota Manatee Parade of Home. Pricing of this home design starts at the high $300s. Within its ample open floor plan, Endless Summer 3 features a foyer, a great room, dining area and spacious kitchen with center island. Its master bedroom exudes the ambience of a retreat with its double doors, a spa-like master bath and a pair of large walk-in closets. The laid-back setting of Woodland Trace and its residences though isn’t only its strongest market appeal. 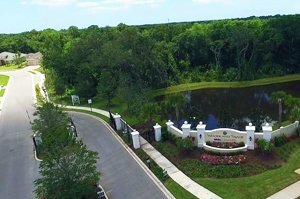 This community is likewise convenient to schools and lifestyle centers of Sarasota, Bradenton and Lakewood Ranch. Its Tuttle Avenue location is linked to major corridors, such as University Parkway and Honore Avenue, opening access to life and leisure hubs that make the living great in this winsome slice of Southwest Florida. Below are the current real estate listings available at Woodland Trace.